Innovation is critical. Hard to argue I would think… But why innovate? Innovation for the sake of innovation is a hobby not a business model. The obvious answer is you innovate to find profit that is otherwise, in the course of normal operations, not going to be realized. Or is it the obvious answer? Recently working on a client engagement where I serve as a fractional CMO we were discussing the coming 4 to 6 quarters and what needed to be accomplished. 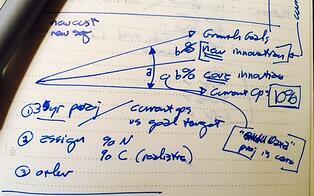 I mapped out a model of projected growth vs. desired growth and worked with the executive to put numbers to the map. Then we began the discussion of how to find that growth. We looked at two paths. Core Growth Innovation, growth found in current clients and current markets and New Growth Innovation, growth from customers and markets not connected to current operations. Core growth is important and we do have a pretty cool project in the works that will utilize client data to craft a new offering. (Amazing what you can do with data you have sitting on your servers…but that is a conversation for another day.) For this client core growth is strong and sustainable especially when considered against operational capacity. So the lesson for me today, New Growth Innovation is not always about revenue, per se. It has other functions and diversification is a solid use of innovation as a business tool. I learn a lot when working with smart clients. What interesting uses of innovation projects have you seen in your business?